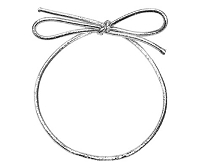 These Metallic Stretch Loops, also known as the Pre-Tied Elastic Bow are an easy way to secure and enhance your gift boxes and gift bags. We sell these in packs of 50 pieces. Add a little decoration to our Cotton Filled Boxes with these colorful Metallic Stretch Loops. These elastic Stretch Loops slip on and off with ease, adding a glittery finish to any Jewelry presentation.